We are the leading madhubani painting online store offering authentic mithila paintings. Madhubani Art Gallery offers you wide range of madhubani paintings avaible to buy online. There is a massive collection of paintings available for sale. All paintings available on our website is handmade and is crafted on silk clothe. To prevent any damage while shipping, we will send paintings withour frame. 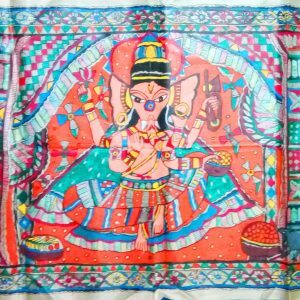 Choose among wide range of madhubani paintings ranging from madhubani kohbar painting, madhubani painting of ganesha, madhubani paintings of radha krishna, madhubani painting of sun etc. Madhubani Art is the traditional form of art originated during Ramayana era. It is the form of art which was traditionally done by women on mud walls during ritual ceremony. Due to its ritual importance, lots of people were engaged in this painting without knowing its importance and uniqueness. It was crafted using natural colour and extracts of natural objects. For example, yellow colour was extracted from turmeric; white colour was extracted from rice etc. But now this style of painting is becoming famous. Due to its unique style and historical importance, it is recognized as the heritage of Indian art among art lovers. Now Madhubani painting artists are using modern technique to preserve this form of art. Handmade papers are still used, but most of them are using silk clothe to increase the life of paintings. 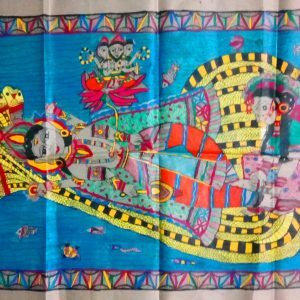 Apart from paper, synthetic colours are also used to craft Madhubani paintings. Art is an essential component of routine life in India where you stumble across them inside temples, on the streets, during festivals and a number of religious ceremonies and the majority of them have a tradition which has been nurtured through the centuries. 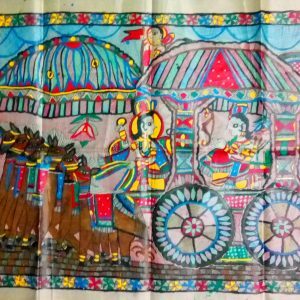 Though Madhubani art has found a means into the modern art world it still uses traditional dyes and artists will even set a coat of cow dung on the canvas in order to provide the image a more conventional feel. It is one of the finest art forms in India. An individual can also buy historic art from select outlets and internet retailers. Ever since then, painting has turned into the main source of income for scores of families. The paintings also utilize 3D images. Because most famous paintings mean to have. Madhubani paintings are extremely distinctive and simple to spot. They are very popular art all over the world for their liveliness and style. They are one of the popular Indian folk art.